Is it possible to validate or discard memories surfaced on bad therapy through palmistry? I am an art teacher and one of my students opened up about very traumatic events. 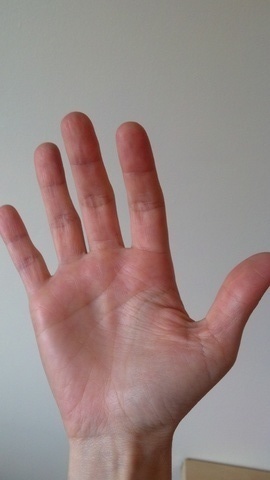 I am studying palmistry but this hand is too difficult for me, I am not a professional. If any of the more experienced members could help, it would be very kind. This woman, 38, had always carried a confused feeling about an abusive childhood. She went to therapy to deal with these issues and in this therapy some terrible memories regarding a relative were released, that is what she believed. Until her therapist himself tried to touch her intimately and made "love" statements. After that, she become insecure about her memories and therefore her identity. Any thoughts based on what you see? I took more than one picture of her dominant hand, the lines are hard to see. Re: Is it possible to validate or discard memories surfaced on bad therapy through palmistry? "Is it possible to validate or discard memories surfaced on bad therapy through palmistry?" I think this is not possible in an objective manner. But I think the hand shows a constellation that can be understood to represent an inclination towards dissociation (head line is disconnected from the life line + there is no interaction at all between the major lines, with a large break in the life line), and mars negative appears to show a weak development. Now, if these patterns are confirmed in the left hand as well then think your client might do well if she would focus on getting emotionally in touch with her body (+ the sensations & emotions involved) instead of living her life from basically a mental perspective - which itself represents a form of dissociation. After all, the fact that she has started questioning her own memories could signal that she developed a pathological pattern of dissociation. Finally, her thumb & the color of her hand look fine - which shows a healthy potential to get in control of her life again by focussing on using her will-power (and in time no longer depend on the input of therapists). Is this helpful so far? I have worked with child abuse before, some are very clear on their memories, other block them completely until adult life. The procedure is always the same for the teacher: refer to therapy. I was trained, in special education, to direct them to counseling, traditional therapy or alternative therapy (sometimes the police unfortunately). But in this case I felt without an answer since therapy made it worse in the past. Your advice makes a lot of sense, maybe Yoga? A change in career? She works in business because she doesn’t believe creative work can provide, she told me this once, after I complimented her drawings. In both hands I noticed crosses below the heart line, the pictures are not very good. Also, many activity on moon and mars but no definition on destiny. Flexibility and color are normal, she is always moisturizing and is allergic to oil painting (many people are). Thank you so much, it is a big opportunity to learn for me and maybe, with your help, I can actually do something for this person. I started palmistry because I watch my student’s hands all the time and it fascinates me, but again, I am not a professional. First of all, thanks for sharing the other hand as well; good to see that it shows a similar pattern. Now, from what you describe I think it would be fine to help her simply 'move on' with her life - e.g. by giving her diffuse memories sort of a safe haven in order to let them rest (instead of fuel those - what appear to be mostly verbal fragments - with further speculation about what exactly has happened between her and the relative). From your description it quite looks like she is in control already, and maybe she basically only has to learn to focus more on making choices that allows her to enjoying her daily life activities? Good luck + I wouldn't spent too much energy on little signs in her hands (like the 'crosses' that you mentioned). Hi learner, here are more pics, that you for the interest! Hope they are not too bad. Hi Martijn, thanks again for sharing your knowledge, you are very generous, I respect your work so much. My point of wonder is precisely what you replied about, the potential to make changes and lead a better live. Some special students have clear signs of mental illness, genetic, neurological malfunction... In their special way, all have potential, that is why we treat medically and stimulate in art classes, for example. However, some people, although they receive diagnostics from doctors I question (to myself), if I am facing a case of over-diagnosing and over-medicating. My impression about the woman whose hands I’m showing is that she is very capable, her shocks and disruptions in life came from the outside, not from her neurological development. I asked about the crosses for that reason. A possibility that trauma + extra sensitivity, when not channelled properly, might make a person feel confused. In case that is supported by a functional head line, which I think I see here although it drops to moon, it is not too much, and there is a fork going up. (?) So maybe people like this would benefit more from accepting their intuition and treating themselves better, than meds? But maybe small signs only matter when they are deeper? I have so much to learn. I would never suggest palmistry to replace medical treatment, I would like to develop myself in the area being aware of how sensitive it is. I know another woman whose clinical depression is questionable. I'll try to get pictures. Suggestions on books are more than welcomed. Thank you for new pictures. I know one man who is the friend of a relative. He is over 50 and very nice person. But he gets violent sometimes with lots of mood swings. His violence is mostly towards family. But head line is good. I don't know his life history. My relative knows but won't tell me. I think there was a bad history with family. The man told me he has bipolar disorder and is taking medication. I have seen head lines with islands and breaks but they are normal people. So, I don't think head line alone gives clues. According to traditional palm reading, islands at starting of fate line show bad start to life. In your friend's hand, there are 2 islands on fate line near wrist. Thank you learner for this information, I agree with you and Martijn. I had another idea, I asked a childhood friend to send me pictures to compare. Her parents were physically violent, still are verbally abusive and highly manipulative. Her sister committed suicide when my friend was 17… I was there so I know these are facts, no speculation or confusion here. She is right handed, 40 years old, chronically depressed under medication. I believe I see islands on the beginning of destiny and a break in the life/head connection, probably on the time of her sister's death. Feel free to correct me because I am such a begginer. I know it is an oversimplification, but can we take those as common elements? Hello, I think it is an oversimplification. I think bad fate line and bad head line also occur in normal people, so it not correct to reach that conclusion. I think researchers like Martijn who study psychology and palmistry are in best position to give correct guidelines. Yes, I can confirm this - in general I would always recommend to step away from the "oversimplification" concerning individual hand signs; this can be done for example by combining individual signs with signs that are found in other dimensions of the hand.